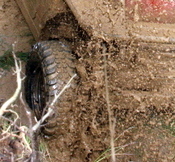 Torbay 4×4 Club was formed to bring the fun of off-roading to all the family. We are an easy going club with an event each month suitable for most 4×4 or off-road vehicles. Each trial consists of 8 sections with 10 gates to each section and we aim to do 4 in the morning and 4 after lunch. High vis must be worn by all children and Marshall’s. Seatbelts must be worn by all when vehicle is in motion. In between sections/ anywhere on site driver/passengers must be in a fixed seat with a seat/lap belt. Cb aerials must be tied down or removed. More details can be found in the Documents section.